Apple has three new iPhones this year: the iPhone X, the iPhone 8 and the iPhone 8 Plus. While all of them run on iOS and have identical hardware inside, only one of them feels genuinely new and that is the iPhone X. It has a fresh new “all-screen” design (with a notch! ), it has a new gesture-driven interface, and it has Face ID. And its price starts at $1,000. 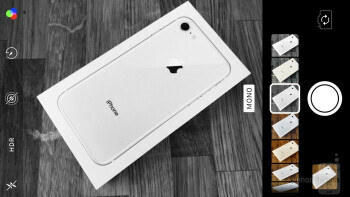 How does it feel using it in comparison with the iPhone 8 and iPhone 8 Plus? Are there any differences in actual performance, camera quality and battery life? 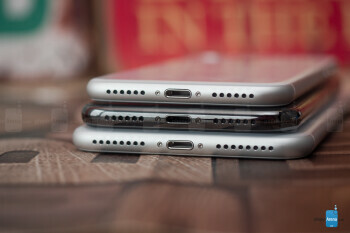 We’ve spent the last few days living with these three iPhones to find out. Big screen, compact body and a stunning design on the iPhone X almost made us forget the notch. The 8 and 8 Plus feel a bit boring. For years now, we’ve had the small iPhone and the “plus” model, an oversized 5.5” _phone_ bigger than most other big phones. What was sorely missing was a mid-sized option, a model with a larger screen, but one that does not feel too big to carry around in a pocket. The iPhone X fits that spot perfectly. And its size might be one of the biggest advantages of a device that you carry with you every day. The iPhone 8 Plus is also the heaviest of them all. It weighs 7.13 oz (202 g), which makes it less comfortable to carry in a pocket. 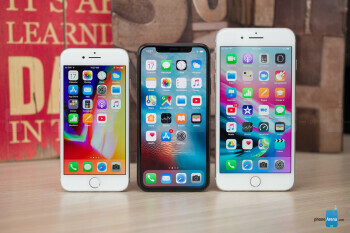 The iPhone X weighs a more reasonable 6.14 oz (174 g), while the iPhone 8 is the lightest and most comfortable to carry in a pocket at 5.22 oz (148 g). Another interesting change in the iPhone X is that it has a super-sized lock button on the right side. We find this very convenient: it’s easier to find and press, and is just more convenient for a button that you press tens or hundreds of times each day. We also like the shiny stainless steel frame of the iPhone X, a distinct element over the matte aluminum finish on the 8 and the 8 Plus. All phones have a stylish glass back, but you only have two colors - gray and silver/white for the X, while the 8 and 8 Plus also have a stylish gold finish. All three new iPhones carry IP67 water and dust protection rating. There is no difference in the level of water protection between them: all can withstand immersion in up to 3-feet deep water for as long as 30 minutes. 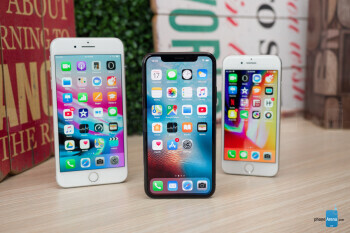 Of course, the biggest difference between these three iPhones is the display: the “all-screen” iPhone X is a stark contrast to the big bezels on the iPhone 8 and 8 Plus (but more on that later). Since it’s all screen on the front, there is no home button on the iPhone X and there is no Touch ID fingerprint scanner either. Instead, to securely unlock your phone, you have Face ID, a brand new system that scans your face and recognizes if it’s you or not. Face ID is a system completely integrated in the front camera panel, the so called notch. In it is more than just a camera for selfies, but also an infrared light and a dot projector. Here is how it works: you lift up your _phone_ and the camera looks for a face (if it’s dark, the IR light flashes to let the camera see in the dark). If the camera detects a face, the dot projector projects some 30,000 dots onto your face, creating a complete 3D map of your face. The result of this 3D scan is sent to a secure chip on the iPhone (the scan of your face is never sent online) where it is compared to the face that you have already registered. If there is a match, a tiny icon on the iPhone X lockscreen unlocks and you just swipe up from the bottom to unlock the phone. This all happens in a split second: the idea is that you just lift up the phone and swipe up, you don’t need to wait to see the lock icon unlock, it all should happen in the background. If your face is not recognized, you will feel a slight vibration and after about a second, you will get to type your PIN code to log in. Apple say Face ID is much more secure than the older Touch ID fingerprint recognition system. The chances of cracking Face ID are 1 in a million versus 1 in 50,000 for Touch ID, according to Apple. And since Face ID uses a 3D scan, you cannot just show the phone a photo of its owner and fool it into unlocking. However, we have already seen cybersecurity firm Bkav create a $150 mask that can successfully fool Face ID, so as any system, this one is not perfect either. We have also compared Face ID vs Touch ID speeds. And while Face ID is impressively accurate for a brand new security system, we feel like Touch ID works more often and unlocks the iPhone a bit faster. OLED shows the finest colors, it looks stunning. But we need more time to know whether it will suffer from burn-in. iPhone 8 and 8 Plus have reliable and great-looking LCD screens. 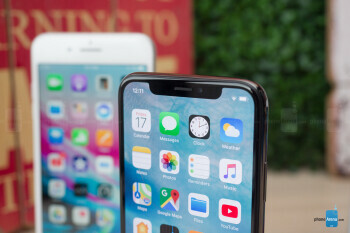 The iPhone X is the first bezel-less screen in an iPhone and the first one using OLED technology instead of the traditional LCD used on all other iPhones, including the 8 and the 8 Plus. First, let’s make one thing clear: the iPhone X has a 5.8-inch screen, but its actual area is smaller than the 5.5-inch iPhone 8 Plus. The reason for this is the different aspect ratio: the 8 Plus has a traditional 16:9 orientation, while the X features a taller, 2.17:1 proportion. You can read a detailed explanation of this here. In real life, this means that when you watch videos on the iPhone 8 Plus, you will be able to see a lot more than on the X. In longer lists or web pages, though, the new iPhone X is able to show more content. What about the smallest of them all, the iPhone 8? It has a 4.7-inch 16:9 LCD screen that shows less information than both others. However, if you deal with apps that are not yet optimized for the iPhone X and still show up in 16:9 orientation with black bars on the top and bottom, you have about the same screen space on the X and the iPhone 8. Here is a detailed look at which screen fits more content in real life! What you don’t find in a spec table is how well screens show color. The iPhone X with its new OLED screen has a few advantages over the 8 and 8 Plus: it has more vibrant colors, deeper blacks and better contrast, all combining together for more impressive visual qualities, albeit not by a huge margin. Its screen is also noticeably brighter and more visible outdoors. But it also has a few downsides: if you tilt the phone you will notice a slight shift in colors towards the blue gamut. This is not a huge issue as it is on the Google Pixel 2 XL, but it’s more noticeable than on the iPhone 8 and 8 Plus. Then, there is one other possible issue: burn-in. Burn-in is an issue that affects OLED displays. Since OLED screens illuminate every single pixel individually, if you do show bright colors in one area, the pixels there can “burn out”. This means that if you leave a black-and-white checkerboard as the wallpapers on the iPhone X for a few weeks, and then change the image to something else, those white squares will “burn in” and will be slightly visible all the time! Apple says it has taken pre-cautions, but admits that no OLED display is immune to burn-in issues. How long does it take until burn-in appears? 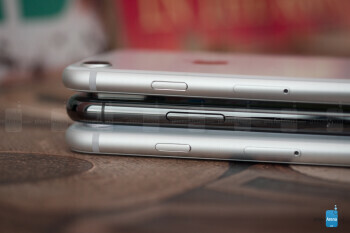 We see no traces of burn-in on our iPhone so far and no other reports about it, so we hope for the best. The iPhone 8 and 8 Plus with their LCD screens do not suffer from such issues. iOS 11 with and without gestures. For the first time in years, Apple is criticized for iOS 11 coming with some performance issues. This, however, applies to older iPhones, while the newest iPhone X, 8 and 8 Plus run about as buttery smoothly as in the past. 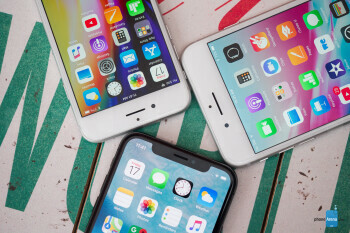 Apple is working on fixing issues for older iPhones, but you won’t see any slow-downs with its newest iPhones. It took us a couple of days to get used to this navigation, but it feels reliable and fluid, and it does not waste any screen space for on-screen keys (like Android does), so gestures do seem like a great solution for an “all-screen” phone like the iPhone X. Do we miss the home button? Not much, quite honestly. This is all because Apple has implemented the gestures in iPhone X well enough and they work reliably. For years now, we’ve had the small iPhone and the “plus” model, an oversized 5.5” phone bigger than most other big phones. What was sorely missing was a mid-sized option, a model with a larger screen, but one that does not feel too big to carry around in a pocket. The iPhone X fits that spot perfectly. And its size might be one of the biggest advantages of a device that you carry with you every day. 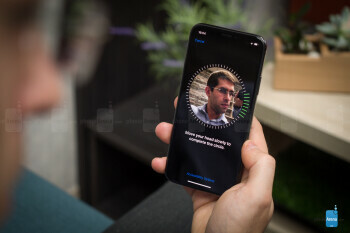 Face ID is a system completely integrated in the front camera panel, the so called notch. In it is more than just a camera for selfies, but also an infrared light and a dot projector. Here is how it works: you lift up your phone and the camera looks for a face (if it’s dark, the IR light flashes to let the camera see in the dark). If the camera detects a face, the dot projector projects some 30,000 dots onto your face, creating a complete 3D map of your face. The result of this 3D scan is sent to a secure chip on the iPhone (the scan of your face is never sent online) where it is compared to the face that you have already registered. If there is a match, a tiny icon on the iPhone X lockscreen unlocks and you just swipe up from the bottom to unlock the phone. This all happens in a split second: the idea is that you just lift up the phone and swipe up, you don’t need to wait to see the lock icon unlock, it all should happen in the background. If your face is not recognized, you will feel a slight vibration and after about a second, you will get to type your PIN code to log in. 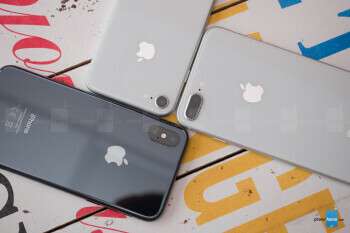 All three iPhones - the X, the 8 and the 8 Plus - have the same Apple A11 Bionic system chip, the fastest mobile processor on the market, period. It ensures smooth frame rates in games and in the interface, and allows fast processing and editing of 4K video. While the two bigger iPhones have 3GB of RAM, the iPhone 8 ships with 2GB RAM. This means that apps will reload a bit more often on the 8, while you can keep more browser tabs and games open on the bigger phones. 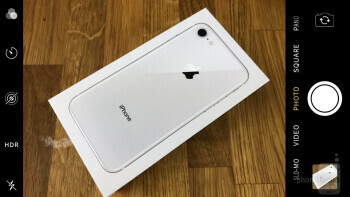 Apple ships its new iPhones in two storage options - a base 64GB storage version and a $150 more expensive 256GB model. As in the past, microSD cards are not supported, so the amount of storage you get cannot be expanded. 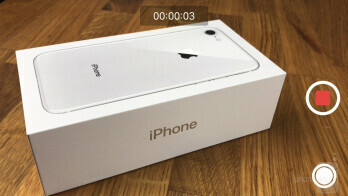 64GB will be enough for many people, but if you hold on to your iPhone for more than two years and shoot a lot of photos and videos, or play a lot of games, you will want to get the 256GB storage version. All capture excellent photos, there are no big differences in photo quality. iPhone X shoots the best portraits in low light and has optical stabilization for the tele lens. 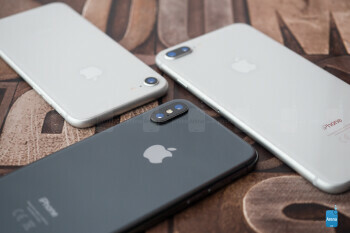 The iPhone 8 Plus and iPhone X both have two cameras on the back - a wide-angle one and a zoomed, telephoto one, while the iPhone 8 only has one, a wide-angle camera. What this means is that you can zoom in two times with better quality and also get fancy portrait mode images with a blurred background on the two bigger iPhones, while you cannot do this on the small iPhone 8. The wide-angle cameras used on all three iPhones are the same: they all shoot at a 28mm focal length and have an f/1.8 aperture. The telephoto lens on the iPhone 8 Plus and the iPhone X, however, is slightly different: it’s a 56mm lens on the 8 Plus and 52mm on the iPhone X. What does this mean? Simple, you get a more zoomed-in view with the iPhone 8 Plus. Another important distinction between these two is that the telephoto lens on the iPhone X supports optical image stabilization (OIS), while the 8 Plus does not have this. OIS makes a difference when you shoot in low light and for video, allowing for sharper pictures and smoother video. 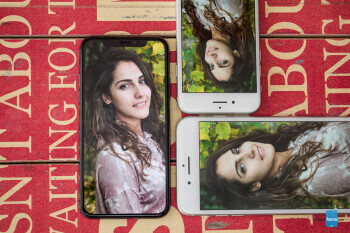 Up front, there is one more area where the iPhone X is a step ahead of the other two: its front facing “TrueDepth” camera can also capture portrait mode selfies with a blurred background! They look really cool. No other iPhone has this feature. Is there any difference in photo quality? The short answer is ‘no’ in most cases. When you use the wide-angle camera, you will get identical results on all three iPhones. Photos look great on all three: Apple has improved auto HDR a lot and it is now more subtle and kicks in more often, giving photos a greater dynamic range, less burned highlights and more detail in the shadows. Also, images look brighter and more cheerful, livelier than on earlier iPhones, so you can just get the image and share it without doing much editing. Is there any difference in Portrait Mode photos from the 8 Plus and the X? We already told you the big one: the 8 Plus has a more zoomed-in lens, while the X has optical stabilization and works better in low light. In regular light, both perform very good. Apart from the difference in view, it seem that there is no difference in colors. On both, colors are generally pleasingly vibrant, but you still have a very noticeable yellow tint and strong contrast that make it easy for a trained eye to see the image comes from an iPhone. This is not a realistic representation of reality, it’s an artistic rendition. For realism, other phones capture more realistic colors (we are looking at you, Pixel 2). Skin tones are also not perfect, with a warm tint to them. The biggest problem with iPhone Portrait Mode remains in edge detection. These are the edges right where the person in the portrait is separated from the background. If you look closer, you can spot a lot of imperfections there. Often, especially with long or curly hair, the iPhone X and iPhone 8 Plus would blur out big chunks of hair. There is a lot of room for improvement here. Both the iPhone 8 Plus and the X also support the new Portrait Lighting effect. The effects feel a lot like filters from other apps. You have studio, contour, stage and stage mono lighting effects. The first one is subtle and we use it the most, the other three are very dramatic and have a very radical look that can be a hit, but also can be a miss. All are still in beta and it shows as sometimes the stage light would cut parts of the hair or a face of a person in a really bad way. You can learn more about Portrait Lighting, in our detailed article here. All three iPhones here record video at up to 4K 60fps, which is… really impressive! No other phone can match this (the Note 8 should get an update with this feature, but we still haven’t received it). There is no difference in actual quality between the three: all have optical stabilization for the main, wide-angle camera, and all perform admirably well. We also did not notice any difference in editing the videos in iMovie. Even with many 4K files, we could still do our edits just fine. All three iPhones now use the modern HEIF and HEVC formats for photos and videos. What does that mean? These new formats can reduce the size of photos and videos in half. 1 minute of 4K 30fps video now takes up 170MB, while it used to require 350MB of space. But - and that’s important - the new formats are not widely recognized yet by many programs. If you share photos to others via the share button, the iPhone will actually quickly transform them into JPEG for easier compatibility. Still, we tried importing a 4K 60fps iPhone HEVC video clip in Adobe Premiere and it could not recognize it. Other programs - even iMovie - do not support the new 4K 60fps format as well. Apple has promised updates in the future, though. The best loudspeaker on a phone, but no headphone jack! The three new iPhones all come with dual speakers: there is one speaker pointed towards the bottom and another one, hidden in the earpiece in the front, pumping tunes directly towards you. The bottom-firing one acts a bit like a woofer, with a bit more depth to it, while the front-facing one is a bit like a tweeter, with less depth to it. The two combined produce a truly impressive, next-level sound in a phone. We did not notice any big difference between the three. All new iPhones - the 8, the 8 Plus and the X - have industry-leading loudspeaker quality. It’s a pleasure to watch a video or play some tunes just using the built-in loudspeakers. Of course, for best quality, you need headphones or big speakers. Unfortunately, there is no headphone jack on any of the three new iPhones. 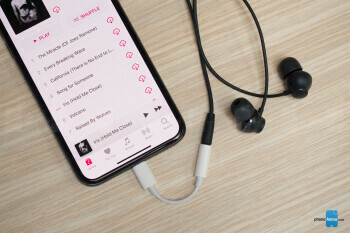 Apple does include a Lightning to 3.5mm audio adapter in the box, so you can use that to connect to headphones or a bigger speaker. And there is also a pair of fantastic EarPods buds in the box. The iPhone 8 Plus has the best battery life, lasting nearly 2 days. iPhone X comes second, it’s slightly better than the iPhone 8. The iPhone X has got a 2,716 mAh battery, the iPhone 8 Plus has a 2,675 mAh battery, and the iPhone 8 uses a 1,821 mAh battery. Despite the iPhone X having a slightly larger battery than the iPhone 8 Plus, it does not quite last as long. We don’t know whether this is due to the new OLED display or some other reason, but we get close to a day and a half to two-day battery life on the iPhone 8 Plus, while on the iPhone X we get a solid day, just a bit better than the iPhone 8. We have run our custom test that measures typical battery use on all three iPhones and below are the results. Here, you can also see how the iPhones compare to other competitors in terms of battery life. There is another important aspect of battery life and that is the time it takes to recharge a battery. 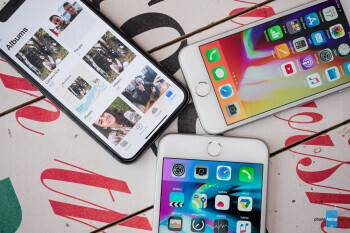 All three iPhones support fast charging, but in order to actually use it, you need to buy a different charger than the slow charger included in the box. Apple sells a $50 fast charging adapter and to use it you also need a USB-C to Lightning cable for another $25, so that’s an additional $75 to use fast charging. This is a rip-off, especially considering that these iPhones are expensive, especially the $1,000+ iPhone X, but it is what it is. Finally, all three new iPhones now finally support wireless charging. In order to use it, though, you need to buy a separate wireless charger and the ones Apple sells in its stores cost $60. With the iOS 11.2 update, Apple adds support for faster wireless charging to the iPhones, bumping wireless charging speeds up to 7.5 watts. Apple has ironed out earlier issues with call quality on some of the first iPhone 8 models. 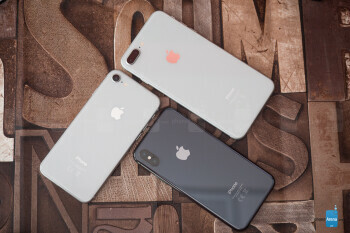 Now, all three new iPhones have similarly great call quality: they are sufficiently loud so you don’t have much of an issue hearing callers in different environments, and call quality is also very crisp, especially for those markets where you can use technologies like VoLTE and HD Voice (dependent on carrier support). So… what are the differences and which one should you get? 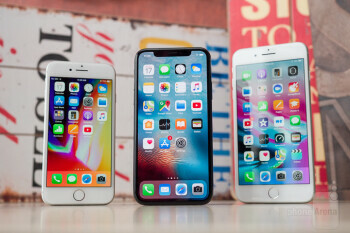 These are the most expensive iPhones, and the iPhone X is singularly the most expensive mainstream phone on the planet. The Apple iPhone 8 is the most compact one and light-weight one, easiest to carry in a pocket. That is its main advantage over the X and 8 Plus. Compared to earlier iPhones, it is more powerful with the A11 chip, has a better camera and supports fast charging and wireless charging. The 64GB model is not too expensive. The Apple iPhone 8 Plus has the advantage of the secondary camera and Portrait mode over the iPhone 8. With its larger screen, it’s also better for playing videos and reading text, as well as for productivity. It also has the best battery life, reaching nearly two days on a single charge. The Apple iPhone X has the most impressive design of all. Its advantage over the 8 Plus is that it has similar screen size in a much smaller overall size. The OLED screen looks more vibrant than on any earlier iPhone. The secondary camera takes better Portrait pictures in low light and the front camera can also take portrait shots. The battery life is slightly better than the 8, but not as good as the 8 Plus. Face ID works fine, but it’s not as fast as Touch ID and does not work as reliably. All in all, the iPhone X is clearly the future, but it’s not quite as polished as the other two, in a way, it’s “the future still in development”. It’s also just cool and new, while the 8 and the 8 Plus feel… a bit boring. So… which one are you getting, if any?